I've said on here before that Ranelagh really doesn't deserve its status as a culinary mecca. I like the place a lot, having lived here for 7 years but I really think there are a lot of restaurants in the area charging bloated prices whilst offering a sub-standard experience. 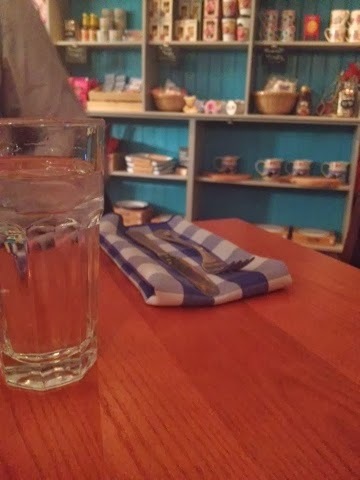 We actually gave up eating around the village for a while as we were sick of feeling ripped off but a Menupages offer for the fairly newly opened Peperina Garden Bistro was good enough to tempt us out into the rain last night. For the modest sum of €35 we were promised a 3 course meal for 2 with a glass of wine thrown in, a very tempting prospect, especially when a middle of the road sandwich with some chips on the side and a couple of soft drinks in most of the local eateries seems to cost that or more these days. Peperina is very cute to look at, looking like more of a cafe really with lots of little wooden tables and pretty bits and bobs(kitsch storage tins etc) dotted about, many of them available for purchase.We were warmly welcomed and advised that we were restricted to ordering from the Early Bird Menu which, though not a problem, wasn't mentioned at the time of booking. Strangely enough the deal I purchased was only available from Thursday - Saturday. Since restaurants usually seem to use these kind of deals to bring in customers on quieter nights, I thought that was a bit unusal. When we arrived, the place was about half full (including several pretty vocal children) but I guess that's what you get for going out to eat at 6.30pm. 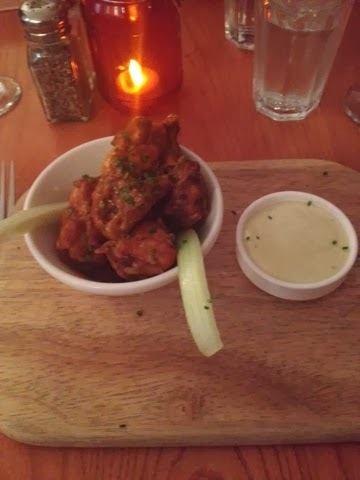 From the list of 5 starters, I chose the chicken wings which came with the usual accompaniments of a blue cheese dip and a couple of stalks of celery. These were great, the skin nicely crisped and doused in a really nice, hot spicy sauce. There were about 6 decent sized wings and I would have eaten more but that is unsurprisingly chicken wings and pizza are the 2 foods my tummy(embarrassingly) seems to have no 'off' switch for, especially if they're as nice as these. 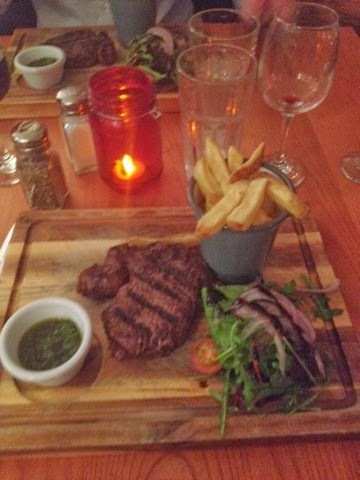 My rib eye steak carried a €5 supplement and came with a herby chimichurri sauce on the side, some strangely bland chips and a little pile of balsamic-dressed salad. It was small, but good and cooked perfectly medium as requested. I enjoyed it but left a lot of the chips as they tasted of absolutely nothing, even when extra salt was added. My lemon posset was much more set than others I've had, more like a panna cotta in consistency really. 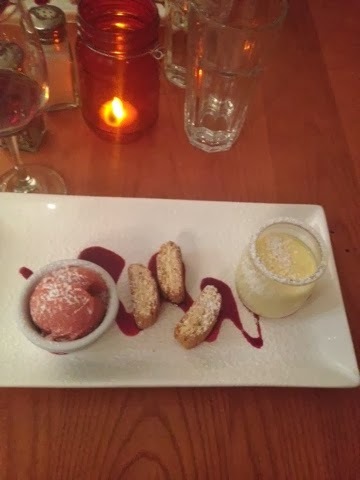 but it was still light, creamy and really enjoyable, served with a scoop of raspberry sorbet, some biscotti and an obligatory drizzle of coulis.